Farming in scientific way is time efficient and result oriented. “My estate became a profitable enterprise by implementing basin management technique. It refers to using power sprayer, underground pipe for sprinkler and drip irrigation, submersible pump, earthing up, mulching, pulp parchment, organic manures and micronutrient application. Also we have rainwater harvesting ponds that fulfills the water requirement for irrigation in the estate. All these techniques to make farming profitable are referred as basin management techniques,” highlights Mrs. K.G. Prema, owns and manages Prema Estate. Her estate spreads in 35 acre located at three locations namely Kattemadu, Hoskeri and Maragodu village, Karnataka. The results attained by implementing basin management techniques are increase in crop production, improvement in quality of coffee and pepper and reduced labour requirements. Coffee and pepper are the main crops cultivated at Prema Estate along with forest trees and fruit trees namely sapota, litchi and many varieties of mango. Coffee varieties grown are Robusta coffee variety and Paniyur 1. 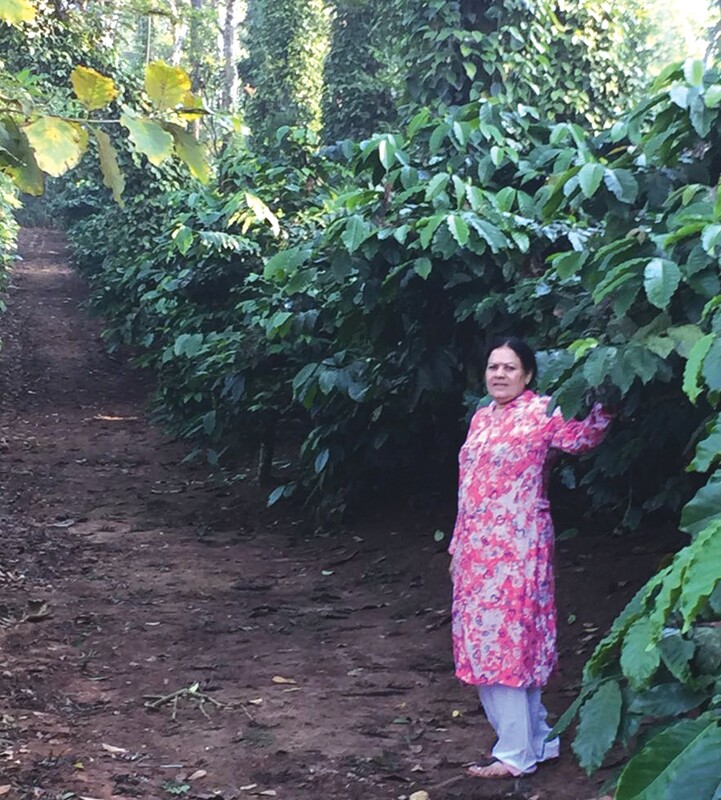 “We didn’t opt for Arabica coffee as it demands more maintenance, disease prone and yields relatively less (10kg/plant). On the other hand Robusta is sturdy plant that requires less maintenance and yields approximately 50kgs/plant,” she adds. Blend of organic and conventional farming practices are followed at the farm. Timely irrigation and manure application is crucial for increasing crop production. All the plants and trees in the estate are fed with in-house prepared compost. To prepare the compost coffee husk, a by-product of coffee pulping is mixed with cow dung and trichoderma and left for composting. It saves 50% cost of fertilizer. Cow dung is obtained from the small dairy unit having four desi breed cows within the estate. “The compost makes good manure,” she asserts. Irrigation is done through three rainwater ponds. Each pond has submersible pump run by electricity or diesel. The ponds are used for storing water and re-charging groundwater. “We bought wet land specifically to dig the ponds. These are 150 x100 feet in size. Wet lands are appropriate for storing rain water as it cannot be done in dry land farm,” she says. Mulching is done for pepper root with leaves and other agri wastes such as weeds. “We cover the soil underneath pepper to avoid moisture loss is called mulching. Also we cover the climber all around with forest trees to save it from hot sun and high temperature. There are more than 200 trees/acre. The leaves from these trees fall on ground and convert into manure,” she informs. Mulching is done from December-May to protect the plants from hot sun. Further to boost the farm production Mrs. Prema insists on plucking coffee fruits little earlier than it matures. “If coffee beans are left on the plant to ripen for long time then health of the plant weakens. The plants also get attacked to berry borer. Thereby to avoid the loss we pluck the coffee fruits little early. This ensures the plants remain healthy for long and starts yielding soon. After harvesting coffee fruits, we prune the plants and irrigate through sprinkler. Consequently within a month it starts flowering,” she says. Another reason to harvest the crop in January-mid February is that usually in Kodagu region it surely rains in February end. With the rains the fruits drop and it is loss to the estate. “To avoid the same we essentially pluck fruits before it ripens. We hire more labours to pluck the coffee fruits that are fed in parchment pulper for processing and the work is completed in just 1month”. Mrs. Prema has installed parchment unit to speed up coffee processing procedure. Time taken to process coffee beans in this unit is just one month which otherwise takes three months! In addition the output of this unit is excellent, “Coffee beans obtained from parchment are of export quality. It gives 47 kg coffee powder from 50kg bag while cherry coffee beans give 27kg in 50kg bag. In cherry coffee the outer husk is not removed and whole coffee bean is dried,” she shares. Annual coffee beans production at Prema Estate is 1500 bags of 50kgs. Mrs. K.G.Prema independently looks after the entire estate. When she took over the estate, it had many problems but with the basin management techniques she turned it all right. “We must work in scientific way as it makes the operations less labour oriented and proficiency is increased. If technology is used in the right manner it is man’s best friend,” she signs off.